Moms deserve to be celebrated every day, but especially on Mother's Day (and all the moms said, "Amen!")! 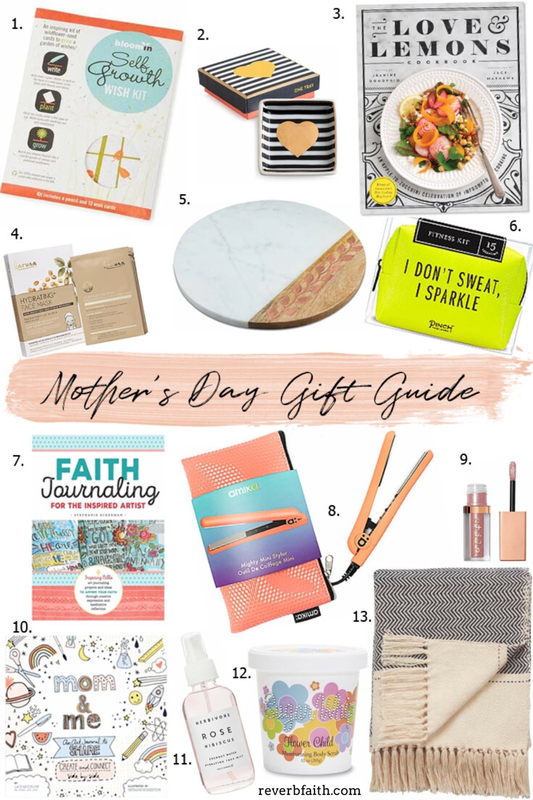 Finding the perfect gift that expresses your love and appreciation for mom is not always easy; luckily for you, I'm here to help you get a jump start on your Mother's Day gift giving! I'VE COMPILED 13 BEAUTIFUL AND UNIQUE GIFT IDEAS THAT ARE SURE TO MAKE MOM FEEL SPECIAL. Check out everything from a fitness kit for the workout guru to a faith journaling guide. These gift ideas are sure to bring a heartfelt smile to your mom or any motherly figure in your life! This blog post contains affiliate links for products I use and love. If you make a purchase after clicking one of these links, I'll earn a little coffee money, which I promise to drink while creating more encouraging content for you! It's a win-win! 1. Plantable Wish Cards ($10) These wish cards are perfect for the mom who likes to garden. Make it a family activity by writing dreams, goals, and prayers on these wish cards, plant them, and watch them grow! 2. Rosanna Metallic Heart Ring Dish ($12) For the mom who loves pretty things, this dish is perfect to keep her jewelry, trinkets, or paperclips on her desk. 3. Sur La Table The Love & Lemons Cookbook: An Apple-to-Zucchini Celebration of Impromptu Cooking ($35) Based from the beloved Love & Lemons blog, this fun cookbook has more than one hundred simple recipes that give the ultimate inspiration to turn farmers market finds into delicious meals. 4. Karuna Hydrating+ Mask 4 Pack ($28) A luxurious treat for dull, dry skin, and free of parabens, mineral oil, and dye, this hydrating mask will make mom feel like she had a day at the spa. 5. Thirstystone Marble & Wood Board ($50) Perfect for the hostess with the mostess, she can serve up a delicious charcuterie or cheese plate in style with the luxe marble, beautiful acacia wood, and copper-tone leaf inlay. 6. Pinch Provisions I Don't Sweat, I Sparkle Fitness Kit ($24) Mom can hit the gym worry-free with this Fitness Kit. This 15-piece kit is stocked with everything needed to keep minor mishaps from getting in the way of her #fitnessgoals. 7. Quarto Publishing Faith Journaling for the Inspired Artist ($15) This dynamic and inspiring resource is for the mom who loves art journaling in Bibles, prayer journals, daily devotionals, and creative life planners. 8. Amika Mighty Mini Styler ($29) Now the traveling mom and the mom-on-the-go can experience the exceptional results of Amika hot tools wherever she goes. 9. Stila Shimmer & Glow Liquid Eye Shadow ($24) Now the glitz and glam mom can dress her eyes with incredible shine, without the clumpy glitter. Stila's liquid eye shadow glides on smoothly with a glistening, high-shimmer effect. 10. Quarto Publishing Mom and Me: An Art Journal to Share ($10) This Side-by-Side Art Journal is filled with fun hand-lettering and artwork; perfect for moms of little kids who want to engage and connect more together. 11. Herbivore Botanicals Rose Hibiscus Hydrating Face Mist ($32) Keep mom looking and feeling her best with this face mist derived from pure plant extracts, coconut water infused with youth-boosting hibiscus flower petals, and moisture rich rose to tone the skin. 12. Primal Elements Sugar Whip Scrub - Flower Child ($20) Keep mom feeling pampered with the feeling of silky skin and the fragrant bouquet of fresh flowers with sweet sugar. 13. Jaipur Spirit Hand Loomed Throw Blanket ($49) The perfect gift for the mom who likes to cozy up with a good book! Light and breathable, yet still soft and warm, this hand-loomed throw blanket is patterned in wide, classic stripes and finished with long and lavish fringe.